Another Monday, another day that I am tired and a bit sad. I will get to why in a bit. But the good news is, I am feeling better each day and my cough is lessening. Thank goodness. This sickness has kicked me in the bootay. Friday I worked late to make up some leave time from having Monday and Tuesday off work. After work, I picked up the girls and grabbed a java chip frap to-go from a favorite local coffee shop. Rory had a golf lesson, so the girls took a nap and hung out with me until he got home. Once he was home and the girls had dinner, we took a long walk. After the girls went to bed, Rory picked up take-out food, we caught up on some dvr'd shows and went to bed. Saturday morning we headed out to breakfast, the girls then took their nap and then we ran a bunch of errands. We needed to get the girls some new clothes (we got 40% off everything at Old Navy and came home with a ton of stuff), get some wine and scotch at Total Wine and some baby shower stuff at Babies R Us. While the girls took their afternoon nap, I went grocery shopping for the week. We took another long walk that evening and made a steak dinner. Sunday we got up and actually made breakfast. It was really good and the girls loved my pancakes. They ate so much bacon too. Successful brunch. During their nap, we put together the girls cozy coupe that they got for their birthday and never set up. We know they love them because they have ridden in them before, but we just never got around to it. Also, during nap time, I tried to find some sunglasses. 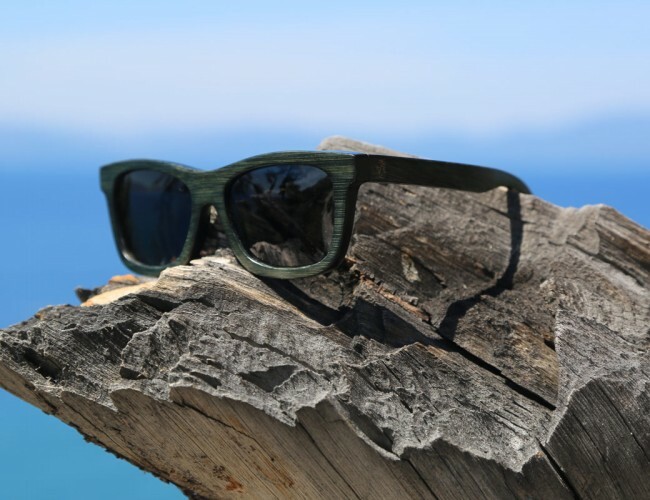 I had my eyes on these (Tahoe Timber Sunglasses), but they didn't have them at the store they used to. So the search is still on. I also tried to get the rest of the baby shower gift, but the store was closed. So I settled on some amazing smoothies from Rawbry and headed home. After lunch, we headed out again to run a bunch more errands. We went to get Walter dog food, to the cheese shop, the garden shop for heirloom tomato plants, Home Depot and Walmart for a few other items we didn't get at the grocery store on Saturday. After errands, the girls took a nap while we had some of our cheese. I got some news from a friend that my old boss had died that morning in a motorcycle accident. She worked with him and her boss called her to let her know and she let me know. I really can't believe it. His 50th birthday is coming up in June and he was having a huge celebration which he invited me to. Plus he was trying to help me pursue new opportunities where he worked. I am really sad to hear he had passed and made me realize (once again) that life is too short, so hug your loved ones and always tell them you love them. After that, to try to get my mind off of things, I did a small workout at home while Rory did some gardening outside. Then I started cooking dinner for the girls and dinner for Rory and I. The girls ate their dinner and then we took another long walk. It started raining on us when we were walking back and it was beautiful. The rain was warm and the girls were so happy. Then it was bath time for the girls and getting them ready for the week ahead. I finished cooking dinner after the girls were in bed and we watched some tv before crashing out early. We finally raised the girls high chairs up and put them into chairs (strapped onto the chairs) since the girls were always trying to push themselves off the bench. I put this picture up on IG last night and it got a great response with lots of recipe requests. While I can't take credit for this, it is one of our favorite family meals (recipe here). We always have lots of leftovers and it is the best comfort food. Enjoy! I am linking up with Biana today for Weekending. Overall you guys had a great weekend. So sorry to hear about your old boss. That's so sad. The girls look like they were having a blast with their cozy coupe. So sweet! Awe thank you. The girls love their coupe. And we did have a great weekend...less sickness! I'm so sorry about your loss. So sad. Ya it is pretty awful. And we only know a bit of the details so far. The girls love their new set of wheels. So sorry about your boss! It's always awful to get news like that. Girls look so cute in the cozy coupe! I love Iowa girl eats! Actually, she is my brother in laws cousin! Happy Monday! It really is. I just hope his son is ok. Oh wow you know her sort of then. I love that dish. I had leftovers today and they were really good. So sorry for your loss. It is never easy to hear news like that. No it isn't. Hope you had a good weekend! So sorry to hear about your old boss! Your steak at home and walk sounds fabulous to me - love nights like that! Thank you. The steak was really good and we got a screaming deal on it. Love evening walks. They are the best. Especially in the rain! Your girls are so darn cute! Sounds like a great weekend! I miss naptime to get things done! So sorry to hear about your old boss. Awe thank you. They get cuter by the day I swear. And now you get to have two little girls. I bet Mila is excited!!! I'm so sorry to hear about the loss of your former boss - that's definitely tough. On a lighter note - your twinnies are too cute and so glad you're feeling better! Aww I am so sorry to hear about your old boss. That is just terrible. Glad you guys had some fun this weekend. Your girls are just as cute as can be. Thank you. It is really sad. I'm glad you had a nice weekend, but I'm so sorry to hear about your old boss. Life is way too short! Thank you. It was a really good weekend. Life is definitely too short. so sorry about your old boss. Death is never easy especially so young. And two naps? they are still taking two naps? Jealous. I know, he was only 49. So crazy. Yes my girls still take 2 naps right now. But in a couple months, they transition to 1 nap once they move into the next room. Their smiles are great :) I'm gonna have to use that recipe soon, thanks! You should make it. It is so good. So sorry to hear about your old boss, Danielle. I hope that you can find some peace soon. You've been through enough this last year. Haha, it feels that way. I am just hoping his son is doing ok.